Everyone around the world celebrates the New Year differently and at different times. Most people in the U.S. celebrate it on January 1. But they may also observe New Year traditions from other religions or cultures. For example, many Asian cultures celebrate the Lunar New Year. This date changes from year to year. The date of the Islamic New Year also changes from year to year. And in India, each religious group has its own date for the beginning of the year. For example, the Hindu New Year comes in April or May. 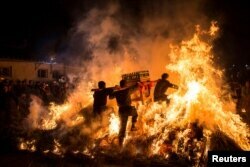 Men carrying a shrine jump over a bon fire, which means a wish for good luck during a traditional Chinese lunar new year celebration in Jieyang, Guangdong province, China, February 2, 2017. No matter when you celebrate the New Year, it usually involves thinking about the past year and planning for the year ahead. People have many different ways of ringing out the old and ringing in the new. But why are bells linked to the calendar change? In the Christian and Buddhist religions, bells are often connected with the New Year. The website CatholicCulture.org explains that "bells serve as a beautiful symbol introducing a new year to be spent together as a community of families ..."
Another website describes how bells are used in Japan on New Year's Eve. "As midnight approaches, Buddhist temples around the country begin ringing out the old year, sounding the temple bell 108 times." Each ring of the bell stands for each of the earthly desires a Buddhist must try to overcome -- all 108 of them! Even those who aren't religious but are a little superstitious, may ring bells at the stroke of midnight on New Year's Eve to scare off bad luck. These age-old traditions have given us the phrase "to ring out the old and ring in the new." The English poet Alfred Lord Tennyson (1809-1892) made the phrase popular with his poem “In Memoriam [Ring Out, Wild Bells].” In this poem, Tennyson rings out, or says farewell to, the bad, and he rings in, or says hello, to the good. Tennyson wrote this poem for Arthur Henry Hallam. The two students met at Cambridge University and quickly became best friends, both showing great promise as writers. Hallam helped Tennyson publish volumes of his poetry in 1830 and 1832. The friends almost became family when Hallam became engaged to the poet’s sister, Emily. However, before they could wed, Hallam died of a brain hemorrhage. He was only twenty-two years old. To remember his good friend, Tennyson wrote the poem “In Memoriam.” He also named one of his two sons Hallam. Here is Jonathan Evans reading the first part of that poem. Thanks, Jonathan. And thank you, our listeners, for the time you have spent reading and listening to Words and Their Stories these past twelve months. We here at VOA Learning English wish all of you a happy start to the New Year. 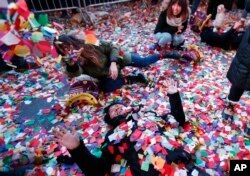 Revelers throw confetti on themselves after after celebrating the new year in Times Square, Sunday, Jan. 1, 2017, in New York. For the New Year, what do you plan to ring out and what do you plan to ring in? Also in the coming New Year, what words, expressions or phrases would you like to learn more about? Let us know in the Comments Sections.